Saturday’s clash at Solitude failed to live up to it’s pre-match billing as neither side really got out of first gear. There was little for either set of supporters to get up out of their seats for over the 90 minutes. But for those not present at Solitude their perception of the game might have been very different when they heard there was three sending offs. It conjures up images of plenty of needle and a game being played at a break neck pace, but it just wasn’t the case. The first two dismissals for Paul Finnegan and Adam Mullan were soft to say the least. Jaimie McGovern’s red had a bit more of bite to it but it wasn’t a headline grabbing incident. Come full time both managers were left scratching their heads and wondering what they had just watched. “If you weren’t here today and heard three players had been sent off you would probably be thinking what a game that must have been, but it wasn’t, it was poor,” said Gerard Lyttle. “It was one of those days when neither side really got at the other enough, and the end result is a boring draw. “I don’t think Paul’s was a red card, I saw those tackles let go, especially when the player is on a yellow card, a bit of common sense could have been applied. “I think the Coleraine one was similar, I don’t think it was deliberate either and again you look for some common sense. “I honestly can’t remember a bad tackle in the game. “Overall it’s a poor day at the office, but I’m pleased with the character we have shown. Lyttle’s opposite number Oran Kearney agreed with his sentiments and lamented the fact he has now lost Mullan for next Saturday’s cup quarter final. 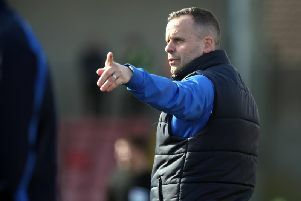 “The officials have a job to do, and they try to do it to the best of their ability, but we now have a player who will miss an Irish Cup quarter final next week because of two handballs,” said the Bannsiders boss. “The first one Adam has his hands across his body, if it doesn’t hit his hand it hits his chest.